Since our kitchen is out of commission we have been trying to brainstorm things that can be made with our grill, microwave, crockpot, or served cold. This was something we came up with using the food we had on hand and it was delicious and perfect for a hot summer night. 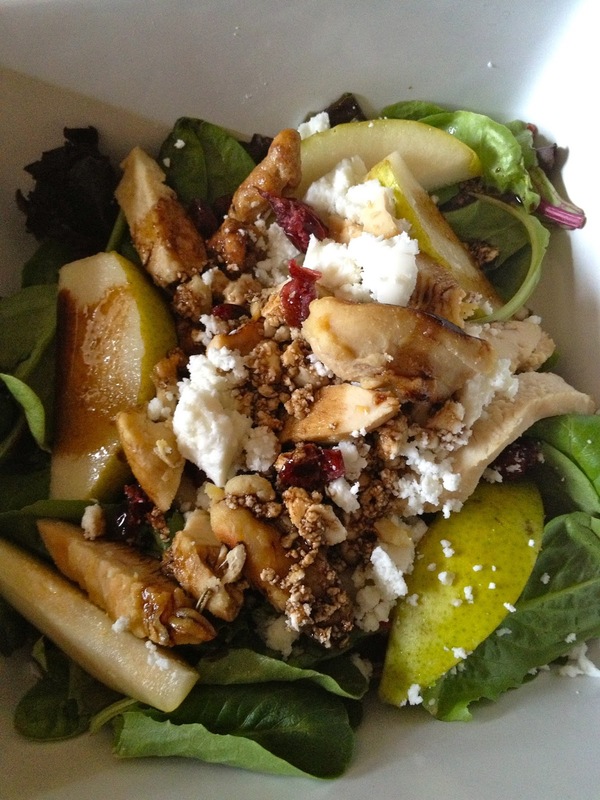 The salad can be prepared with varying amounts of the ingredients depending on your tastes. I will include my approximate amounts. We used a mixed greens lettuce package, sliced pear, dried cranberries, crumbled feta, glazed walnuts, and some pre-cooked chicken. Thank goodness for my mother making freezer meals for us when she was here early last month. We used some seasoned chicken she sliced and froze for our salads. Between the two of us, we used one pear (that would be half a pear for each salad for those of us that have trouble with doing math without a calculator). I added about 1 small sliced chicken breast, 1/8c. crumbled feta, 2T. glazed walnuts, and 2-3T. dried cranberries on top of 2-3c. mixed greens. I made a vinaigrette dressing with olive oil and blackberry ginger balsamic vinegar for my salad, but if you don't have crazy flavors of vinegar and oil lying around, a raspberry vinaigrette would be good, too. This makes enough for one dinner sized salad. We served it with french bread and olive oil dipping sauce. It was an easy, delicious meal for a hot summer night! 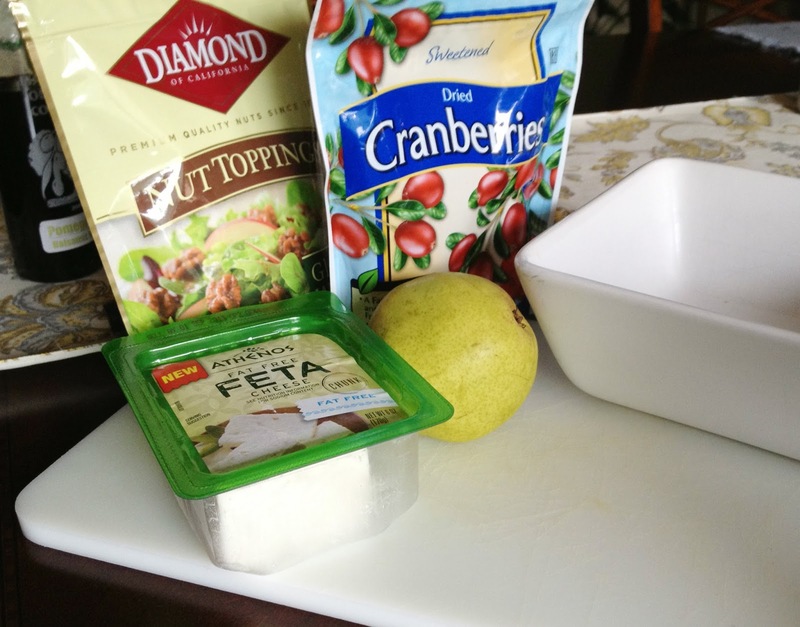 Place lettuce in a large bowl or plate and put chicken, cranberries, feta, walnuts, and pear on top. Drizzle with vinaigrette dressing and serve cold. Thankfully my husband will eat them as long as he can put ranch dressing on (ick, but oh well. I'm not eating it that way)! It's a nice side salad without the chicken, too. We had a salad almost exactly like this (just without the pears) the other day for dinner! 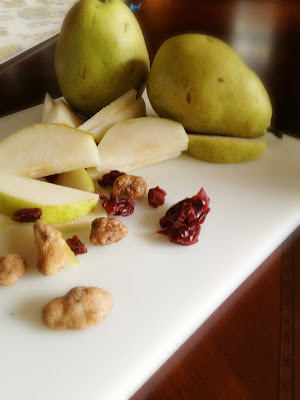 I might have to try it with pears next time, yum! Great minds think alike! ;) The pears add a nice sweetness to it. 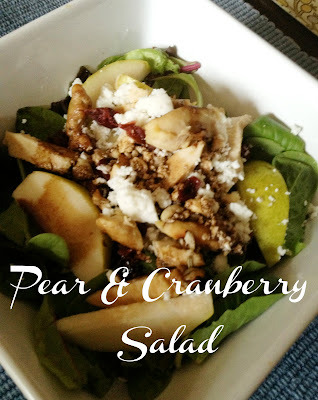 This is by far one of my favorite salad recipes!! Great post! What a pretty summer salad! Thanks so much for sharing at All Things Pretty! Pinning to my salads board!